Limousine hire in Penarth, Cardiff and all local areas around the Vale of Glamorgan. From stretch limos to party buses to wedding car hire. Looking for limo hire in Penarth? Whether you want a classic car for your wedding day or something fun and exciting for a big night on the town, we've got the perfect vehicle for you. A picturesque coastal town within easy reach of all the amenities of central Cardiff, Penarth is a popular location with brides and grooms looking to get married in the area. Make sure your transport is as special as the location by hiring one of our luxury limousines for the occasion. 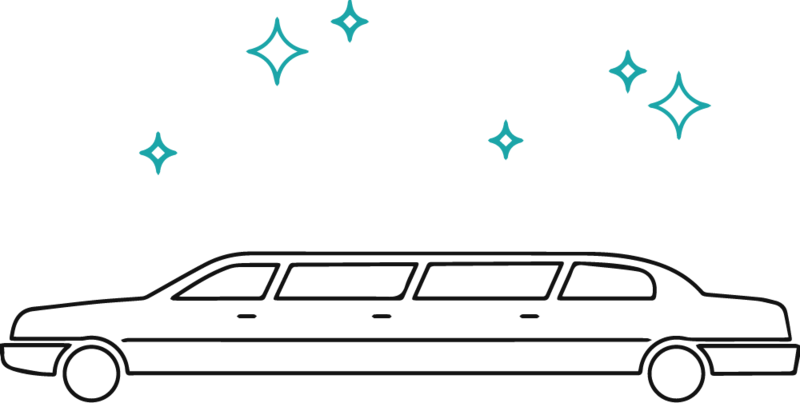 Enjoy the glamour of our American stretch limos, Rolls Royce cars, Hummer limos and Chrysler limos or turn heads in one of our more modern designs. From pink limos and Mini Cooper limos to stretch Ferrari limos complete with state-of-the-art sound systems, we've got something to suit every taste. Our Penarth & Vale of Glamorgan limo hire service is also great for those planning a big night out. Whether you're dining out in Penarth or starting your night here before heading into central Cardiff, our luxury limousines are a great way to arrive in style. For hen and stag nights, birthdays and big celebrations, check out our amazing stretch Hummer limos. With enough room for up to 18 people on-board, these popular vehicles have everything you need for the ultimate party on wheels including karaoke machines, light up LED dance floors and flat-screen TVs. All of our limousines come complete with a professional chauffeur to take care of everything from driving and navigating to serving glasses of complimentary champagne. You can hire them for just a few hours, a whole day or as long as you need. So whatever your requirements, our limo hire in Penarth has the perfect solution.